The CCTV footage of the suicide bomber, who is responsible for St.Sebastian’s Church explosion in Katuwapitiya has been released to the media. The bomber was seen at around 8.56 am and at around 8.59 am. He enters the church premises carrying a very large backpack. The CCTV camera inside the Church also recorded the suicide bomber entering the church after touching a small child in front of the church. He then made his way through a door on the left side of the church before setting off the bomb which killed many including children. MB JEWEL unveils a brand new single titled “GRACE” which features MSN GANG boss ORITSE FEMI. Erstwhile beauty queen, Sandra Okagbue has reportedly settled her differences with high life king, Chinedu Okoli . PSG‘s 3-1 triumph over Monaco on Sunday night ensured Le Parisien secured Ligue 1 title for the sixth time in seven seasons after second-placed Lille failed to win at Toulouse, helping Dani Alves becomes the most decorated player in football history as the Brazilian secured the 42nd trophy of his stunning football career. A man identified as Uche Terfa from Benue State took to Facebook to share photos of the gift Fulani herdsmen gave them on Easter Sunday. Governor of Zamfara State, Abdulaziz Yari has revealed how the Emir of Zurmi once asked him to “go and wipe out” Dumburum Village because it has been a hideout for bandits for over three years. Ukrainian comedian Volodymyr Zelensky has won a run-off election to become the country's next president by a landslide, exit polls suggest. 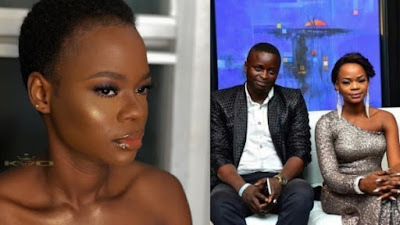 Olajumoke has confirmed that she has divorced her husband via an Instagram post, as she also changed her surname to Chris.Olajumoke who confirmed that she divorced her husband as she reverted her surname to Chris, also placed a curse of misfortunes she escaped on her follower who questioned her divorce and further called her a prostitute. She however deleted the post shortly after. 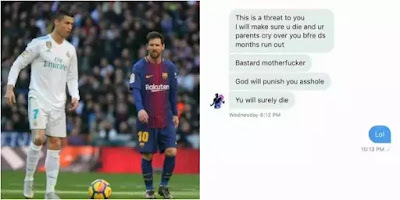 A Nigerian lady has cried out for help after she was threatened by a man over arguments on who is better between Messi and Ronaldo. 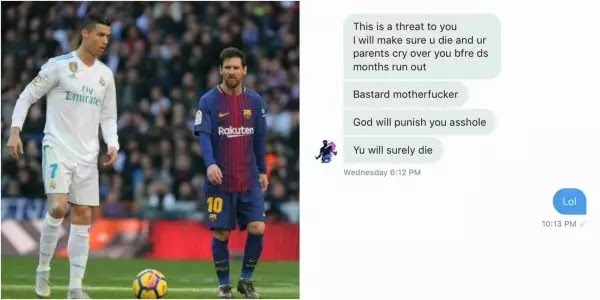 The lady who took to twitter to report the incident, stated that she is ready for the man, @Tiwatopee77, and he should also await the visitation of the combination of The god of Thunder and Amadioha at his doorstep. suburbs around 7 p.m on Friday. and burnt many houses,” he said. silent while people continue to attack us. and we didn’t kill even an insect. that Jukun militia first attacked the Tiv. “Last night, Ikyaior village came under attack. being pushed to the wall. in to restore peace,’’ he said. I am in church for Easter,” Mr Misal said. A middle aged man, Mr.
poured the content on the wife. her face down her body. taking laws into their hands. Williams Uwakwe otherwise known as @medicallywillz, a medicine and surgery student of Imo state University is on a march doing his campaign titled "knowledge against cancer". It has seen many minds being enlightened as to what causes cancer and how to be free of it. Cancer is a terminal sickness ravaging nearly half of the world's population. He says "fruits is the food and leaves are the medicine" he is the co founder of the "Prime health initiative". Avoid caffeine and sugary drinks. 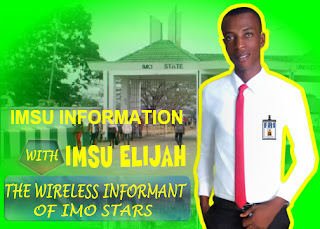 In the bid to fast tracking the 'keep IMSU clean' initiative, a front line student support team known as "TEAM ACTIVE" has donated about 47 waste bin basket to Imo State University and promised to set up free browsing facility for students as part of their support to the current administration of Prof. (Mrs) Adaobi Obasi. The Coordinator of the team, Cmrd. Chimaobi Alfred popularly known as "ACTIVE", said that the gesture was unprecedented and initiated to alleviate the cost burdensome on the shoulders of the school Management. He called on other public spirited individuals, teams and corporate organisations to emulate them. The distribution of the donated materials started from the school main gate to faculties, from lecture halls to offices. The coordinator of the team Alfred Promise, a microbiologist and a 300L student attributed the success to team spirit and pledged to keep playing an active role in the school as it is the bedrock to developing future leaders of tomorrow.